When looking at the Sunny Health & Fitness SF-B1110 Indoor Cycling Bike and you see its price it can leave you wondering if you only get what you pay for. In our review we look at the good and the bad to determine whether the good ratings are justified and look at how good a workout you can get at home no matter what intensity you want. It certainly looks the part and it is heavy with a good sized flywheel to provide a smooth natural ride. It gives you the ability to adjust the seat and handlebars in 4 directions to get the bike to the optimal size for the user. It is a well priced bike making it affordable for many people. It doesn’t have some of the frills of more expensive bikes but that does mean there is less to go wrong and it is probably more important to have a spin bike that is stable and will last the distance. The bike is heavy. It has a steel frame and can be relied on when you are pushing hard sprinting or standing up pushing hard against the resistance. You shouldn’t experience any wobbling even when moving from sitting down to standing up. Some people have noticed that the handlebars can move slightly from side to side when riding the bike hard. They’ve solved the issue by adding shims to close the gap in the pole. Some of this movement may be the result of not tightening up the adjustment knobs up enough to prevent this from happening or it might be a manufacturing fault with that one particular bike. And those that have noticed it have said that it is slight and doesn’t affect the workout. This is not a common occurrence, and if it more than a slight movement it is not how it should be, and it should be reported to Sunny as they will work with customers to sort it out. If you have an uneven floor the bike feet are levelers and can be used to level up the bike to prevent the rocking you might otherwise experience. People who have been using the bike for more than a couple of years report that they continue to get a very good workout and it is stable. The only item that needs replacing is the resistance pad and that is to be expected. The seat and handlebars can be adjusted horizontally and vertically. This helps in getting the bike to fit you properly to prevent any overstretching and cramping. The horizontal adjustment of the handlebars is not something you normally see at this price range and it does help greatly with sizing the bike for an efficient and comfortable workout plus it will help to prevent any soreness. The vertical adjustment is done by loosening the adjust knob and pull the pop pin and slide the pole to desired height and inserting the pop pin the appropriate hole and tightening the knob. There are only 3 holes you can use in the pole in the handlebars which is a bit restrictive. The horizontal adjustment is similar but uses a L-shaped knob and you slide the seat or handlebars to position you want and then tighten the knob. It is quick to make these adjustments. This means the bike is usable by a number of people as it only takes a minute or so to adjust the bike. Everything does need to be tightened up fully to ensure the seat or handlebars don’t wobble when you are working out hard. There is no official guidance as to the heights you can adjust the bike for, but I’ve found that it works best for people between 5 ft 2 inches and 6 ft 2 inches (and some people at these minimum and maximum heights may find it not quite right depending on their leg length). The resistance is supplied by a wool felt pad that sits on the top of the flywheel. The resistance is adjusted by turning the tension knob that is on the frame above the flywheel. The pad should last 6 months to a year or longer with normal usage. For replacements you need to contact Sunny Health to buy them. Some bikes like the Sole SB700 do have kevlar resistance pads which are harder wearing but they do cost more. There is a noise that sounds like a shushing sound that comes when you apply tension to the resistance pad but it isn’t that loud and won’t disturb others in the house. If noise is an issue for you (and most don’t think this noise is an issue at all) you could consider magnetic resistance but this normally costs more. The only bike I’ve reviewed with this type of resistance is the Keiser M3 plus and it costs about $1000 more. The single pad on top of the wheel means you get a good consistent contact with the flywheel and this helps to prevent variability in resistance that can make the ride choppy and annoying. When applying the tension it can be sensitive and you don’t need to turn it much before it comes on hard making it impossible to pedal or vice versa it eases up very quickly. Some people like this and some don’t. But importantly it is consistent as it is applied and doesn’t vary in strength as you pedal (if it is kept lubricated as recommended by the company). This means most people can get used to this and find it a benefit due to not having to turn knob too much. The Sunny Health & Fitness SF-B1110 Indoor Cycling Bike has a chain drive. This is like you get on a road bike. It provides you with the same type of riding experience in regards to feel, noise and maintenance. It’s not a loud sound. It is just the same as bike but with a guard round it that helps quieten the sound a bit. The guard also helps to prevent you banging your ankles on the chain and getting any oil or lubricant on your clothes or skin. The maintenance required is to keep the chain lubricated and tightened as required. This will help to keep it working well and prevent any noise issues. The other type of drive used on these bikes is a belt drive and compared to that it is going to be a little noisier and require extra maintenance as described above. Eventually belt drives do become loose and need replacing whereas with a chain drive you can continue to tighten them up as required. The pedals come with toe straps that you slide your shoes into and tighten them to fit your shoes. They keep your feet in place and they won’t slip out when you are pedaling hard. It won’t take cleats or spinning shoes. You can swap them out with any other standard bike fitting pedals. So you can replace with SPD pedals or any other type of pedal you may want. The thread on the pedals is 9/16. The bike has a fixed gear which prevents you from coasting like you might do on an outdoor bike. When the flywheel is moving the pedals keep moving and so do your feet. You need to either apply the brake by pushing down on the tension knob or weight for them to come to stop as the flywheel slows down. This is a feature of many spin bikes so that you can’t coast during a workout and get more out of it than you would if you coasted. It can be annoying until you get the hang of it. The q-factor for the bike is 8 1/2 inches which is the horizontal distance between the pedals. This is quite wide and may feel uncomfortable for keen cyclists used to a shorter distance. It is likely to be fine for most users of the bike and is about an inch wider than what is found on many spin bikes. Seat. The seat is just about universally accepted as being uncomfortable. You can try to get used to it or try a gel seat cover or use padded bike pants to help alleviate the pain on your sit bones. You can also replace the seat with any standard fitting bike seat so you can have one that you find more comfortable. Smooth Ride. The flywheel weighs 44 lbs. This gives the cycling on the bike more of the feel that you are riding an outdoor bike. It provides more a cyclical pedaling motion with the momentum the flywheel has in keeping the pedals turning rather than the up and down feeling you get with lighter flywheels. This keeps the pedals moving so that they don’t slow down as you go through the top and bottom of the cycle. It feels more natural this is what stops the jerkiness of the cycling motion. Handlebars. The handlebars are designed so that you can comfortably ride with your hands in the 3 positions of:- with them resting in the center when cycling seated, at shoulder width when bracing yourself when seated or standing and at the ends of bar when standing and pushing hard. You can rest arms on the handlebars as they have a rubberized coating that helps make them more comfortable. The coating helps prevent blisters and your hands slipping when they become sweaty from your workout. Riding Position. This bike is intended to be ridden in the same position you would ride an outdoor bike where you lean forward on to the handlebars. If you are unable to sit in this position due to back issues or other concerns you may be better looking at a recumbent or an upright bike. Noise. The bike is not silent. You are going to hear the chain turning as you pedal and the noise from the resistance pad on the flywheel. The noise level is similar to that you get with an outdoor bike. You should be able to watch YouTube videos or films or TV programs without turning up the volume. Anyone in the next room probably won’t hear the noise from the bike making it fine for an upstairs apartment or for working out when others are asleep in your home or when the children are napping. Dust And Dirt. The bike is going to give off dust and lubricant when you are working out. The dust is from the pads and lubricant from the chain and pads. You may drop sweat when you are working out too. All that ends up on the floor. If you want to protect your floor from the dirt, dust and sweat a rubber mat is a good investment. The bike doesn’t take up too much room with a footprint of 46.5 inches by 20.5 inches. If you don’t have somewhere you can keep it permanently and want to store it out of the way when not being used you can move it using the transport wheels even though it is heavy. The bike weighs in at 101 lbs. The transport wheels at the front make it an easy job to move when you tilt the bike on to them. They take on most of the weight. They are a good size so you can move the bike freely over most surfaces including carpet. Sunny Health & Fitness have made this job fairly straightforward. The bike comes mostly assembled. You put on the front and rear stabilizer bars (after removing the shipping bars), saddle post and seat, handlebar post and handlebars, and lastly the pedals and drink bottle holder. This is done in 5 steps per the instruction manual and the screw, bolts and nuts for each step are in bags labeled by step number – avoiding the need to measure and compare sizes. The tools required to complete the assembly are included with the bike. The assembly takes about 30 minutes once you have it out of the box. Most people find the parts well machined and don’t have an issue with lining up the holes and inserting the posts into the frame. If you do have an issue the company can help you if you contact them. The only real difficult part of the assembly is handling the weight of the bike. It’s shipping weight is 118 lbs and it weighs 101 lbs when fully assembled. It is therefore advised to have 2 people assemble the bike so the weight isn’t such a problem. This bike does not come with a console. This helps to keep the price down and it is not unusual for spin bikes to not have a computer or to only have basic one. The idea is that you use a spin bike to do a workout one that you design yourself or you follow along to. The lack of a console can make it hard to determine your progress over time, to train in your heart rate zone or keeping your RPM or cadence up when working out. If you do want to track progress and your metrics you can retro-fit a bike computer such as Cateye Velo 7 Bicycle Computer but it does need a bit of adjusting to attach the spoke magnet to the flywheel. The bike comes with a bottle holder . It is on the right fork of the bike. It is a bit out of the way and can be a little difficult to get to while you are cycling. The holder has some tension in it to keep the bottle in place which can sometime make it a little awkward to put the bottle back when you’ve finished your drink. There are no other accessories that come with the bike. This lack of accessories is not unusual for spin bikes or indoor cycles. Some people have found that they can rest their ipod or ipad on the handlebars and keep it in place with an elastic band or strap. You can then workout to your favorite spinning video on YouTube. 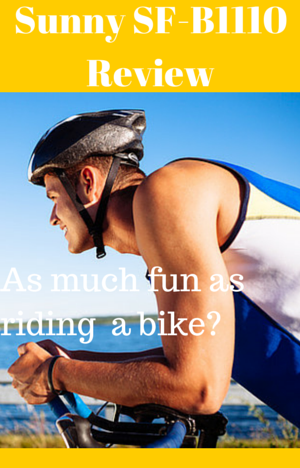 I’ve read through over a 100 customer reviews and most are very positive about the bike. Most like how sturdy and reliable and are very pleasantly surprised at the quality for the price. They have had, or are expecting, many years of stable and energetic workouts from it. The most common concern is the seat. There is no denying it is uncomfortable and you are probably going to want to replace it or find a gel seat cover if you can’t put up with it. Some reviews have mentioned that the bike had a few issues but these are rare and many have had their issue sorted by the company when they contacted them. It is a durable quiet bike that gives a good solid workout is the main thrust of the reviews. This is an affordable bike. It doesn’t come with a lot of features. But the features it does have do a very good job in providing you with the basis of exercising or training as hard as you want. It has a good system of adjustability especially the horizontal adjustment on both handlebars and seat. You don’t normally see this feature at this price which enables you to get the bike to fit your size for a better and more efficient workout. There are 2 colour versions of the bike and they are priced differently. When I checked the white one was cheaper than the silver one. This is a good bike for a beginner or someone with a bit more experience. It doesn’t have all the frills of some of the more expensive bike but it provides you with everything needed to workout in the comfort of your own home. You can adjust the bike to your size to get the most effective exercise. It is solidly built and doesn’t move around or shake when you are pushing yourself hard. It is a good affordable bike that can keep you exercising and training for many years. I’ve had this bike for a year now. I like it and it’s an affordable alternative to the more expensive bikes. The issue I have is that the seat and handle bars have limited height adjustment. I have them both at maximum height and my legs still feel crunched. I’m only 5’7 but I have long legs and arms. Would have been nice to bump that seat up one more notch. I’m trying to get my money’s worth out of it before I damage my knees. Will be replacing it shortly for a higher quality bike that has more adjustable seat and handle bar height options. Thanks for the feed back on the bike. What bike did you go for?